If you’re reading this post, I’ll assume you are familiar with Bayes’ theorem. If not, take a look at my introductory post on the topic. Here I am going to explore the origins of the theorem, as well as its intuitiveness. I am sure that after reading this post you”ll have a good feeling for why the theorem is what it is. I am also sure you will find the simplicity of its mathematical derivation impressive. 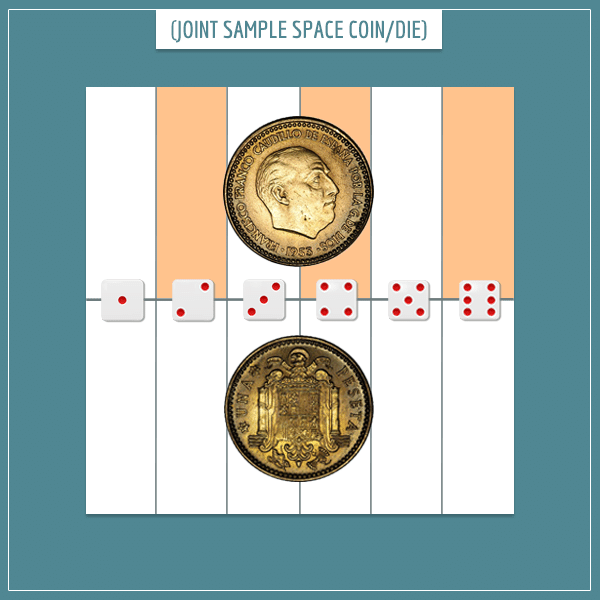 For that, some familiarity with sample spaces (which I discussed in this post) would come in handy. So, what does Bayes’ theorem state again? Put simply, Bayes’ theorem is used for updating prior probabilities into posterior probabilities after considering some piece of new information (that is, some piece of evidence). 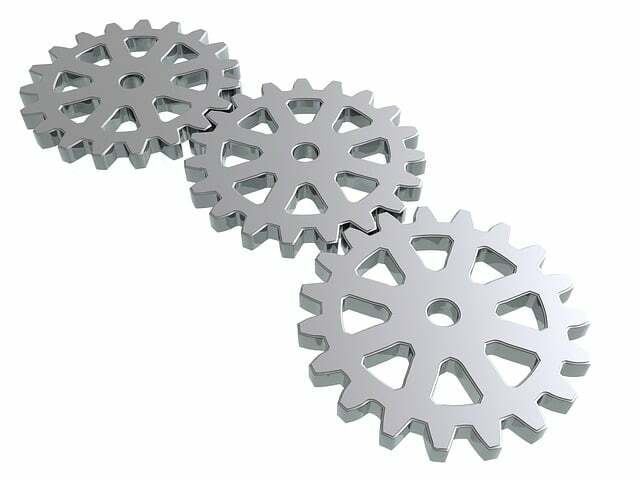 The exact way the updating process takes place is given by the relationship asserted by the theorem. Namely, the posterior probability is obtained after multiplying the prior probability by the likelihood and then dividing by the evidence. But have you wondered where this exact relationship comes from? The easiest way to answer the question is by first defining joint probabilities and showing how the theorem naturally pops out. Notice the difference with the notation for conditional probabilities where there is a vertical line between the two events (instead of a comma). 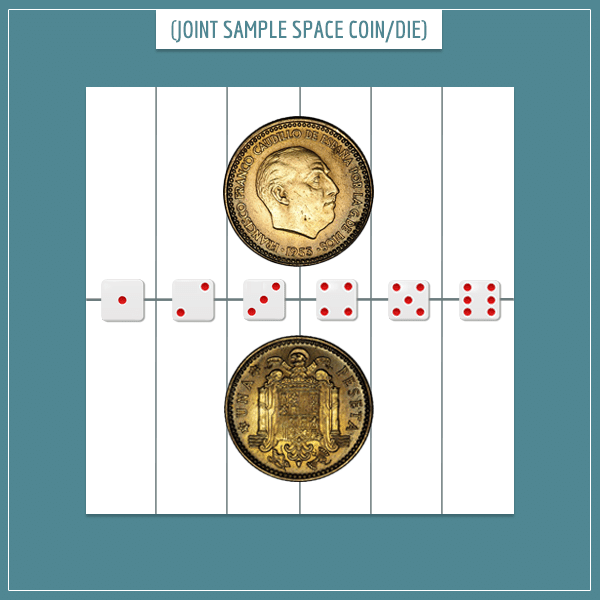 The horizontal line divides the square into 2 equal parts which represent the outcome of the coin flip. First, the rectangles are from the upper half of the square which represents the probability of flipping heads. Second, only those rectangles associated with rolling one of the three even numbers are marked. As you can see, 3 out of the 12 (or 1/4), of the rectangles satisfy the definition of the event. The joint probability of two events is the probability of the first event times the conditional probability of the second event, given the first event. Why? This part is slightly tricky, so arm yourself with your abstract reasoning skills. Remember, the joint probability of two events is the probability that both events will occur. For that, first one of the events needs to occur, which happens with probability P(Event-1). Then, once you know the first event has occurred, what is the probability that the second event will also occur? Naturally, this is the conditional probability P(Event-2 | Event-1): the probability of the first event, given that the second has occurred. The result is the same as with the previous approach. Pretty neat. The intuition behind this symmetry is that the order of the events isn’t a concern. You only care about their intersection in the sample space, which is the probability of both events occurring. However, that doesn’t mean the terms are in any way interchangeable in general. Each term represents a different subset of the sample space and hence a different probability or conditional probability. Yes, this is really it. Now you officially know the origin of Bayes’ theorem. I told you it was simple. Okay, this is one way to mathematically derive it. It’s still not quite enough to get a good feeling for it, however. Does Bayes’ theorem make intuitive sense or is it some mathematical truth that you just have to accept? I’m dedicating the final section of this post to exploring this question. Imagine you have a hypothesis about some phenomenon in the world. What is the probability that the hypothesis is true? 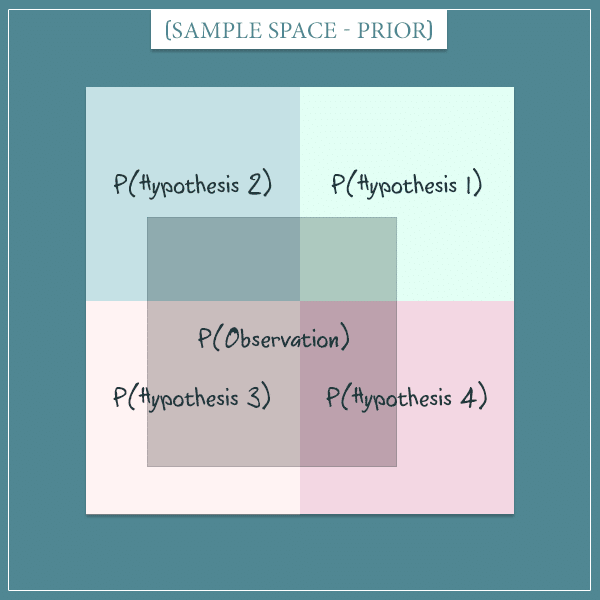 To answer the question, you make observations related to the hypothesis and use Bayes’ theorem to update its probability. The hypothesis has some prior probability which is based on past knowledge (previous observations). To update it with a new observation, you multiply the prior probability by the respective likelihood term and then divide by the evidence term. The updated prior probability is called the posterior probability. The posterior probability then becomes the next prior which you can update from another observation. And so the cycle continues. Now I’m going to show how the two extra terms actually transform the prior. Notice that the posterior probability is directly proportional to the product of the likelihood and the prior probability. So, the higher the likelihood, the higher the posterior probability is going to be. The likelihood reads as “the probability of the observation, given that the hypothesis is true”. This term basically represents how strongly the hypothesis predicts the observation. If the observation is very consistent with your hypothesis, all else being equal, it will increase the posterior probability. Similarly, if according to your hypothesis the observation is very unlikely and surprising, that will reduce the posterior probability. Say someone tells you that there is a living being on the street: I’ll name it Creature. Your strongest hypothesis is that Creature is a human (because of the frequency with which you’re used to seeing humans in your neighborhood, compared to other animals). That is, you estimate the prior probability P(Human) to be relatively high. To sum up, the more consistent the observation is with the hypothesis, the more probable it is that the hypothesis is true. This aspect of Bayes’ theorem should have a strong intuitive appeal. Think about the sample space as representing all possible worlds. Some of those worlds are consistent with the observation and are bound within the dark square depicting P(Observation). Now this is the crucial part. After you make the observation, you eliminate the worlds that are inconsistent with the observation from the sample space. Remember that the total probability of a sample space is always equal to 1. You redistribute this probability among the hypotheses. You do this proportionally to the percentage of the new sample space they occupy. Each hypothesis used to have a probability of 0.25 but this is no longer the case. 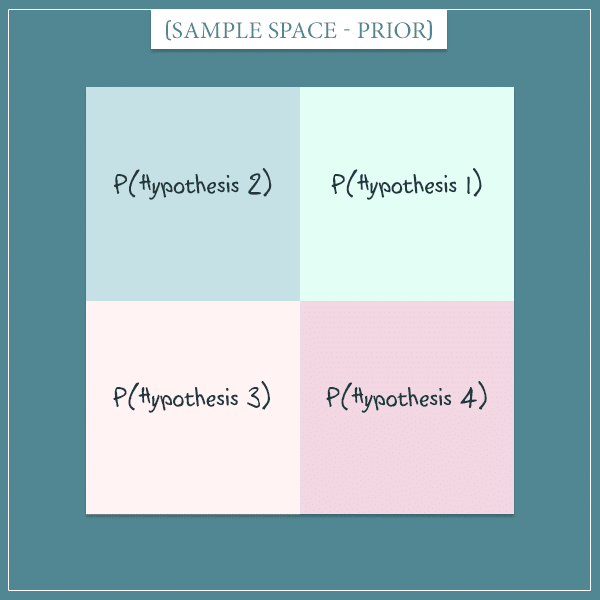 For example, you can see that in the updated sample space hypothesis 3 has gained a much larger portion, whereas hypothesis 1’s probability has shrunk significantly. Well, this is Bayes’ theorem in a nutshell! You can think about it as the portion of the observation that your hypothesis explains (in relation to how much the other hypotheses explain it). Since the evidence term is in the denominator, its relationship to the posterior probability is inversed. To understand this, think about what makes the evidence term grow in the first place. If P(Observation) is high, that means the observation wasn’t a surprising one and it was probably strongly predicted not just by your hypothesis, but by some of the alternative hypotheses. For example, if your observation is that Creature is breathing, the posterior P(Creature is a human | Creature breaths) will not be too different from the prior P(Creature is a human). The reason is that, even though this observation is consistent with the hypothesis, it is equally consistent with all alternative hypotheses and it will support them just as much. On the other hand, if P(Observation) is small, that means the observation was surprising and unexpected. A hypothesis which happens to strongly predict such an observation is going to get the largest boost of its probability (at the expense of the probabilities of the other hypotheses, of course). 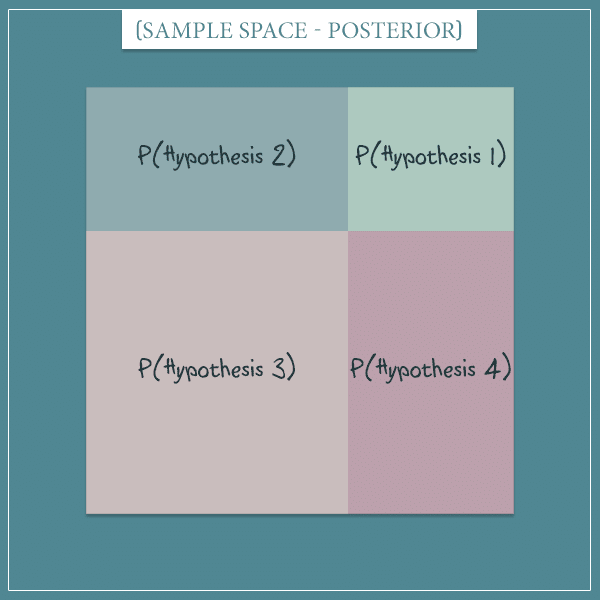 In this post, I presented an intuitive derivation of Bayes’ theorem. This means that now you know why the rule for updating probabilities from evidence is what it is and you don’t have to take any part of it for granted. I also gave some insight on the relationship between the 4 terms of the equation. Perhaps you already understood the theorem, but now you also feel it! So, go ahead and start confidently applying it in whatever areas interest you most. Really intuitive. Thanks! Big thumbs up for the blog in general.